Are you tired of watching "Hannity" on Fox News, with its repetitive usual cast of characters, pounding their chests, bragging about what new information they have uncovered and offering false hope that justice will be done over the alleged crimes of Hillary Clinton, Robert Mueller, James Comey, Barack Obama and their comrades! This may boost ratings for the network, but it does not lead to any concrete result. Are you then tired of seeing our so-called Department of Justice (DOJ), run by the obviously compromised Attorney General Jeff Sessions, who had ceded nearly all authority to his Deputy Attorney General Rod Rosenstein, do nothing as well! To the contrary, just last week Rosenstein and his "idol," Special Counsel Robert Mueller, rather than seek justice with regard to Hillary and the rest, instead "politically indicted" twelve Russian intel officers, just days before President Trump's summit with Vladimir Putin in a blatant partisan effort to derail it. Rosenstein did not further justice, rather he participated in subverting it. Ironically, Russia's alleged hacking of the Democratic National Committee (DNC) and the emails of John Podesta in particular, Hillary's campaign manager, actually performed a valuable service for the American electorate in the weeks and days leading up to the 2016 presidential elections! How else could we have learned the scope and depth of the deceit and alleged criminality afoot at the DNC and the Clinton presidential campaign, given that the DOJ, then controlled by President Obama, was obviously intent to sweep it under the carpet. This subterfuge is immense here. At all times, the same information which the Russians allegedly obtained was available – including the 33,000 plus "destroyed emails" from Hillary's private server – in the computer banks of our National Security Agency (NSA), which continues to collect mass surveillance on the entire populace, bar no one. To top all of this off, if the Russians are the culprits, then why to this day has the Federal Bureau of Investigation (FBI) and DOJ prosecutors not seized and analyzed the computer servers of the DNC and Clinton presidential campaign to "confirm" this? The bottom line is that we cannot anymore believe a word that comes out of the mouth of federal prosecutors at DOJ and its Office of Special Counsel, much more the government as a whole, including our so-called intelligence community. These are just a few examples why the citizenry now must rise up and bring about justice ourselves. Like the Justice League comprised of Superman, Batman, Wonder Woman, the Flash and Aquaman, We the People can no longer rely and count on the institutions of government to clean out the rats' nest, otherwise known as the swamp, that infests the nation's capital. It falls upon us to do it! And that is why Freedom Watch, seeing ordinary citizens as the real superheroes, has just formed a Justice League of its own. Go to www.freedomwatchusa.org or www.fwjusticeleague.org to sign up and enlist! Donning our capes and other crime fighting tools, as well as the real instruments of justice like the citizens grand jury, We the People now have no choice but to take legal matters into our own hands. And to this end, beginning on September 26, 2018, Freedom Watch's Justice League and yours truly will convene the first of a series of grand juries in Dallas, Texas, and just for starters indict, try, convict, sentence and then seek legal and peaceful citizens arrests for Hillary Clinton, Mueller, Comey, Obama and their ilk – to finally put them in the slammer where they belong. If we do not take this strong and decisive action, and it has been sanctioned by the late Supreme Court Justice Antonin Scalia who in 1992 ruled in a landmark case styled United States v. Williams, 504 U.S. 36 (1992) that the grand jury does not belong to the three branches of government but rather to the American people, then this country will soon drown under a fatal cancerous sea of corruption. For as John Adams, our great Founding Father and second American president, said just days before he and his fellow patriot revolutionaries signed the Declaration of Independence on or about July 4, 1776, in Philadelphia, without ethics and morality and religion it does not matter how many times we change rulers or our forms of government, the new republic will not have a lasting liberty. And, it was his colonial revolutionary colleague from Virginia, an equally great Founding Father and third American president, Thomas Jefferson, who added that We the People would need to rise up and renew our nation through revolution every other generation, as the inevitable corruption among the political and legal establishment "elites" would indeed metastasize. Well fellow patriots, Freedom Watch's Justice League, with you and me as its superheroes, will fight and win this new revolution peacefully and legally through our citizens grand juries! Watch the videos embedded in this blog and sign up today. Like our Founding Fathers and early presidents Adams and Jefferson, we must wage war, as it is no longer enough to tune in to Fox News' "Hannity" for pure entertainment without results. The fate of the nation and the freedoms which our first and real superheroes – the likes of Washington, Adams, Jefferson and Franklin fought for and won, cannot be lost because our so-called Justice Department and FBI are corrupt and thus unwilling to mete out justice for the likes of Hillary Clinton, Robert Mueller, James Comey, Barack Obama and the rest. Like Superman, Batman, and Wonder Woman we must seek and mete out justice outside of a government that has abandoned and failed all of us repeatedly! Indeed, at the end of the Hollywood film from which Freedom Watch's Justice League gets its name, Batman is asked by the evil villain, Steppenwolf, who is seeking to take over and rule the world, what the caped crusader is seeking? The response: "truth and justice!" That is what we must together urgently seek and mete out before it is too late! 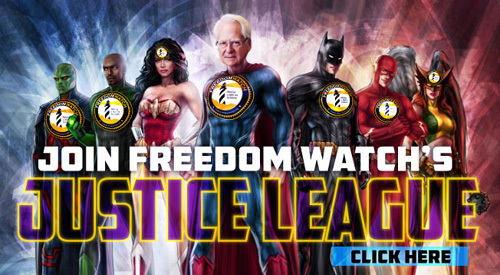 Freedom Watch Justice League's citizens grand juries need your strong financial and moral support and prayers, as well as your participation, to be successful and restore this nation to the vision and reality of our Founders! Go to www.freedomwatchusa.org or www.fwjusticeleague.org to urgently enlist in and donate to our just cause, as the road which we all must now take is costly!